This week’s recipe for French Fridays with Dorie is a fanciful interpretation of ravioli. In this version, mandoline-sliced avocado stands in for the pasta to enclose a piquant crab filling. Clever, no? I will say it sounded delicious. However, in reading the week’s chatter about problems and questions for this recipe (P&Q), it became apparent that slicing the avocado successfully was an iffy proposition. I followed the lead of several other Doristas and transformed the ingredients into a salad instead. In my case, I made the crab filling according to the recipe. 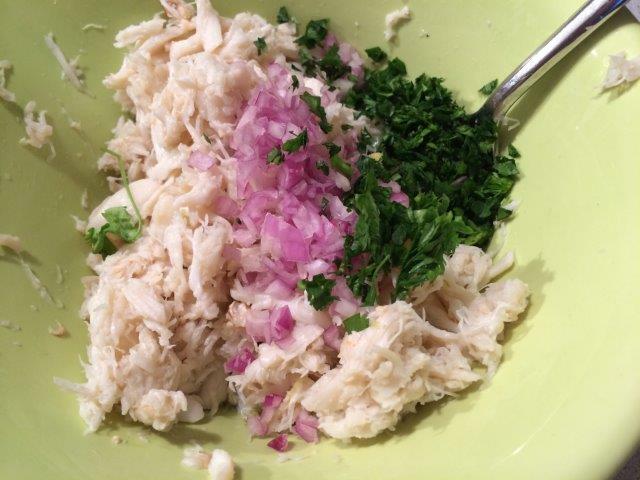 Lump crabmeat was flaked and tossed with lime zest, lime juice, shallot, cilantro, and some olive oil. Rather than attempting to thinly slice it, I chopped the avocado into chunks and tossed it in some lime juice. Then, I gently folded the avocado into the crab salad. Since the idea behind the ravioli obviously intended to give the presentation some flair, I packed the crab salad into a container to mold into a nicer shape than a pile on the plate. 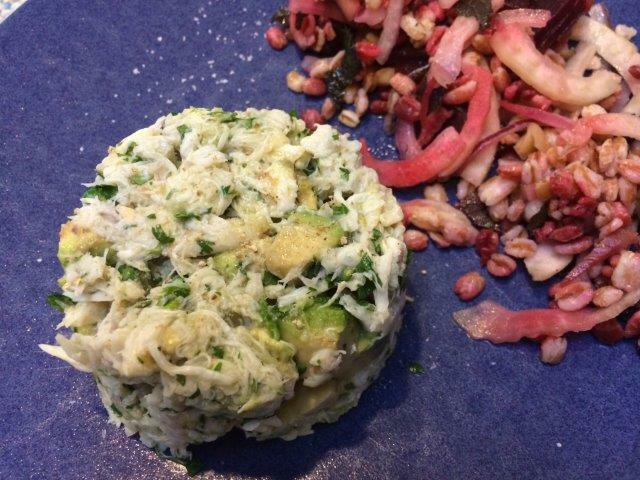 I made the crab salad into a meal with some farro, beet, and fennel salad on the side. A wonderful light summer supper. Verdict: Nice but not memorable. Howard wasn’t home to try it, but I predict that he would have liked it. 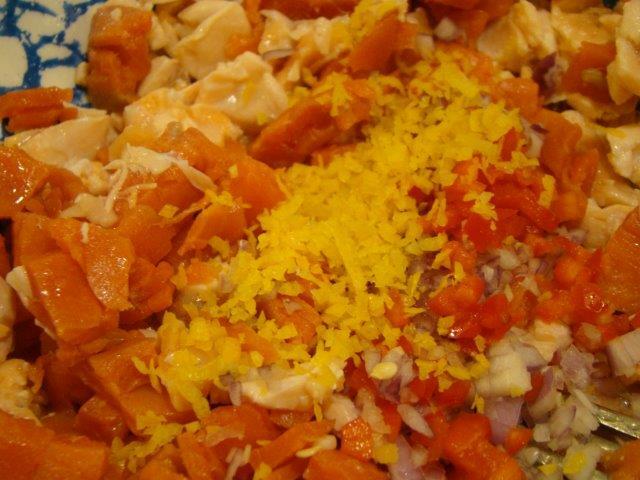 If you want to see how my Dorista friends interpreted this recipe, check out their links here. You can find the recipe it in Dorie Greenspan’s book Around My French Table. Over the past year or so, I’ve grown to love rillettes as a pre-dinner appetizer or part of a picnic lunch. What are rillettes? It’s the French word for a pâté-like paste traditionally made from pork. I tried my hand at pork rillettes over the winter. In Dorie Greenspan’s book Around My French Table, she offers three different versions of rillettes made with fish. Previously, we’ve made rillettes with sardines and tuna. This week, salmon was on deck. Salmon rillettes is the most colorful of the trio. It’s yet another recipe I’d describe with the word “confetti”. 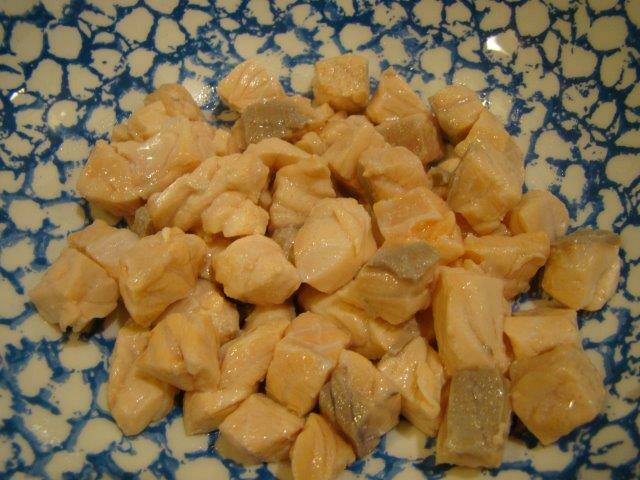 The pale coral of fresh salmon provides the base for flecks of deep coral from smoked salmon, red from a chile pepper, light purple from shallot, a sprinkling of yellow from lemon zest, and a flash of fuchsia from pink peppercorns. The preparation was simple. 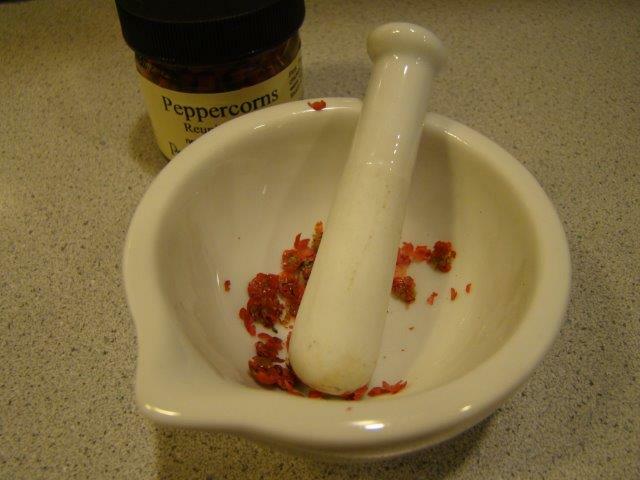 Small chunks of salmon are barely poached in diluted wine with some lemon peel, a sliver of the chile pepper, and some coriander seed and white peppercorns thrown in the pot. The salmon is then mashed with the other ingredients along with softened butter and lemon juice before packing it into a ramekin to firm up for spreading. This spread is quite versatile. 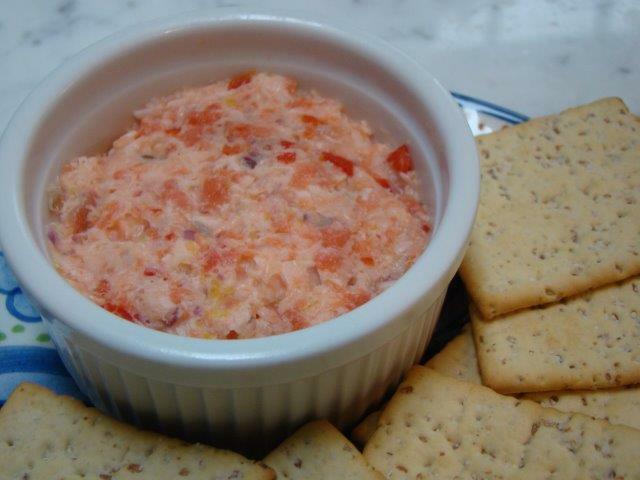 I enjoyed salmon rillettes spread on crackers for a light lunch. Tonight, we’ll enjoy it again as an appetizer. If there’s anything leftover, it will be part of the picnic lunch I’ve planned for tomorrow. I did find that the smoked salmon overpowered the poached salmon both in flavor and texture. Next time I make this, I would adjust the proportions by doubling the fresh salmon and halving the smoked so the fresh fish could shine. 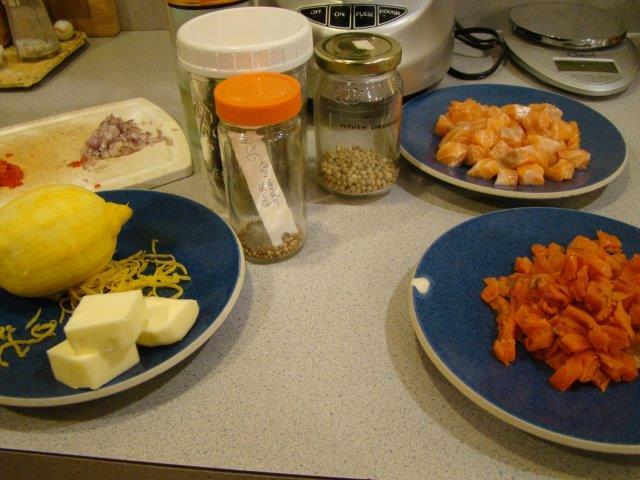 To see what the other Doristas thought of salmon rillettes, you can check out their links here. The recipe is, of course, in Dorie Greenspan’s book Around My French Table, or you can find it on-line here.